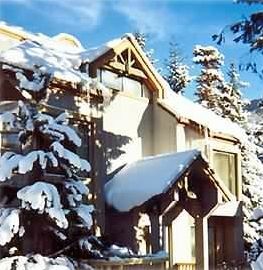 Townhome, 4 Bedrooms, 2 Baths, (Sleeps 8) Short walk to both mountains! Our beautiful four bedroom townhouse is less than 200 yards from: Whistler & Blackcomb's high speed lifts, cross-country skiing, Kids Kamp, shopping, and village dining amenities. You will not need a vehicle in this quiet location! Please note: We have a four night minimum booking. The Non-Smoking townhouse has its own separate ground floor entrance and has been tastefully decorated featuring heated Mexican tile floors on the main floor and is freshly painted throughout. The carpets were replaced in January, 2016. There is original artwork throughout. The living room has a new leather sofa, flat screen HD television, a stereo with iPod connection. There is also high speed secure wireless internet. The kitchen has custom cabinetry with matching ceramic tiles. Fully-equipped, including a new dishwasher,new stove and new fridge with an icemaker. The dishes, glassware and cutlery are matching. A microwave, and toaster oven along with all cooking utensils are provided. There is a complete selection of condiments, herbs, and spices. The dining room seats eight at a beautiful, one of a kind table. The three-piece, custom-tiled bathroom also has a shower. The second floor offers three bedrooms and a full bathroom. Two of the bedrooms have queen sized beds, one has a TV and DVD player. The third bedroom has bunkbeds. All of the bedding is new as of December, 2017. The Jacuzzi jetted tub is on this level as well as a full bathroom. Laundry facilities are also on this level. The third floor has a new double bed and a double futon. There is also a TV, DVD Player and a Nintendo as well. This is a great area for the kids to veg! I have been skiing at Whistler since 1971 and have been an owner since that time as well. We skied Whistler in the old days, so really appreciate the amenities that the two mountains offer. Both of our kids went through kids kamp and raced for the Blackcomb Ski Club. This is our third property at Whistler, and is unquestionably the best location in the entire valley. The location of this property sold us so we bought it in 1993. We rented here for several years before buying and realized that there is no better location in the entire valley. Our unit in particular is very attractive as it is at the end of the building and very private. We do not have any neighbours. It was completely renovated several years later, and again in 2015. New cotton bath towels, and hand towels in both bathrooms. Cable TV provided using a national provider. The deck is only usable in the summer months. Of course! Some of the best slopes in North America. There are three excellent golf courses in the immediate vicinity. Downhill and cross country skiing is 100 yards away, with five minute access to the three high speed chair lifts to both mountains as well as the cross country ski trail. There are three golf courses within walking distance. Tennis is available all year with both indoor and outdoor courts. This is the best location at Whistler Blackcomb.